We’re already in the middle of February and that just means Valentine’s Day is just around the corner. If you still don’t know where to take your date on this special day, don’t worry, we got your back! 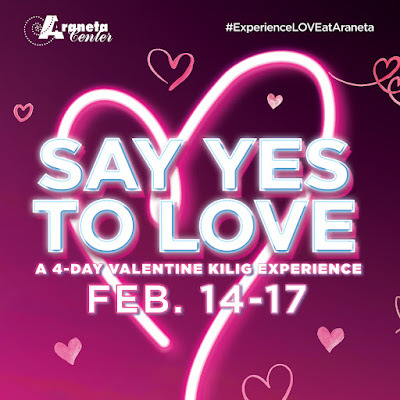 Listed below are five restaurants around Araneta Center, where you and your date can enjoy a great meal and a lovely time on the Day of Hearts. With romance already on its name, couples will definitely have a good time making that K-drama-inspired date a reality at Romantic Baboy! For just P499 per person, you and your date can enjoy unlimited pork and beef barbecue with their eight choices of samgyupsal or different meat slices and six unlimited side dishes! Candle-lit dinners are fine, but these barbecues will definitely light your fire. Romantic Baboy is located at the Foodlane, ground floor of Ali Mall. If you and your date are craving Filipino dishes, Mesa is the place to go! Mesa offers an array of Filipino classics with a twist. Decked with minimalist interiors that set up a romantic meal, Mesa serves have all-time favorites like Sisig, Crispy Pata, Kare-Kare, and Sinigang with its best-sellers Baked Scallops with Garlic Butter, Suahe on the Rocks and Laing 2 ways. Mesa is located at the ground floor of Ali Mall (near Times Square entrance). Couples will definitely have a sweet time—literally and figuratively—at Conti’s. While it is famous for some of the most delicious cakes in town including the refreshing Mango Bravo, the wicked Choco Overload Cake, and the delectable turtle pie, Conti’s also serves flavorful rice dishes, pastas and breads. There’s something for everybody. Conti’s is located at G/F of Gateway Mall (Gen. Malvar side). The Eatery provides refuge to couples who just want to enjoy a delicious meal on a quiet night. With its chill atmosphere and no-frills attitude toward food, The Eatery and its fusion of American, Italian, and Japanese cuisine are a breath of fresh air. Its must-try dishes are Grilled Wagyu with Truffle, Chicken Wings, and Marinara Meatballs Pasta. The Eatery is located at Manhattan Parkview (General Malvar). Still on the getting-to-know-each-other stage and can’t decide on what cuisine your date loves? Why not try Four Season Buffet and Hotpot? It has a wide array of food selections—from dimsums, sushis, barbecues, seafood, and balls, allowing you and your date to cook your own meal while sharing stories. Four Seasons Buffet and Hotpot is located at Manhattan Parkview (Times Square Street).